← HarborLAB Helps Tree Giveaways! HarborLAB’s dock at its current Yonkers Paddling and Rowing Club home. HarborLAB Facilities Manager Patricia Menje Erickson seated, YRPC Commodore John Maggiotto in waders. Lovely Hudson River and Palisades in background. Photo by Erik Baard. HarborLAB’s first season is closing with continued burgeoning growth. We agreed with Yonkers Paddling and Rowing Club to purchase its dock as that storied organization (over a century of paddling tales!) upgrades and expands. HarborLAB Facilities Manager Patricia Menje Erickson will oversee the refurbishing of the dock, which floats level, has new floats, and is decked with durable recycled plastic timber. We’re very grateful to NRG Energy and TF Cornerstone for their renewed sponsorships, which will make this work possible. We’ll also have budget transportation of the dock from the Hudson River to Hunters Point. We’re also grateful to YPRC and its Commodore John Maggiotto for this arrangement to foster our safe growth. 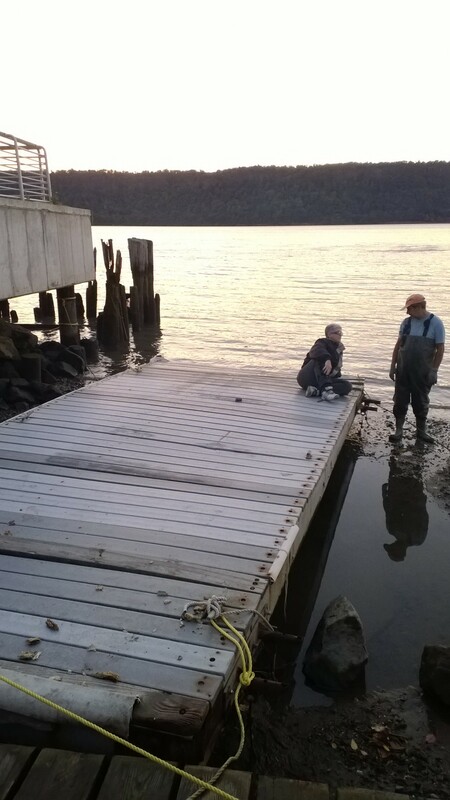 We will move the dock to our launch in November. The dock is among those built through a program coordinated by Metropolitan Waterfront Alliance in 2000, under the direction of Carter Craft.